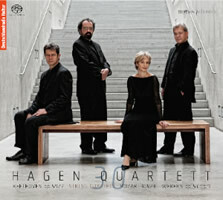 The Hagen Quartet is 30 – so happy birthday to them. 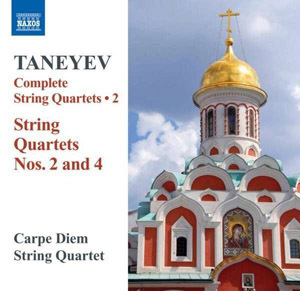 String quartets seems to hold together better than most ensembles, but even so, 30 years is good going. They still have three of their original members as well, siblings Lukas, Veronika and Clemens. Their recorded legacy over the period has been little short of phenomenal. They seem to have abandoned the (sinking?) DG/Universal ship in recent years, but they've been picked up by the Myros label, who are now releasing their work in good quality SACD audio, so their fans have no cause for concern. There is an interesting interview in the liner notes for this 30th anniversary release. It is never stated which of them is answering the questions, and all the answers are phrased in the first person plural, which reads quite strangely. Nevertheless, the main point that is made is that the quartet have gradually moved their priorities in recent years towards directly expressing the emotion in the music. And that is exactly the impression that this recording gives. The performances and the sound have a real immediacy. There no apparent desire to create atmosphere or a period feel. Instead, the players get straight down to the nuts and bolts, given strident performances with the emotion of the music as the guiding principal. I'd hesitate to describe anything here as pretty. Despite the spacious recording venue – the Siemans-Villa in Berlin, the recorded sound is quite bare, with little appreciable resonance. Each of the players goes for a focussed, often quite woody, sound. But what it lacks in warmth it more than makes up for in emotional and spacial immediacy. That sense of emotional directness isn't Romantic as such, and it is telling that there are no Romantic era works on the programme. There is little in the way of rubato, and phrases are outlined though subtle dynamic gradations. These are performances with equal and large measures of emotion and discipline, qualities that serve all three composers very well. Both the Beethoven and the Mozart are given a sense of inner propulsion, the music moving from section to section with a Classical sense of inevitability. The Mozart in particular benefits from the avoidance of sentimentality, allowing it to flow directly on from the middle-period Beethoven as if it were the work of the same composer. And any listeners who harbour suspicions that Mozart's string quartets are trivial will be confronted by the sheer emotional depth that the Hagans find here. Given the quartet's almost unmatched track record when it comes the 20th century repertoire, it seems a shame that the Webern works are consigned to just a few minutes at the end. Even so, they form the ideal conclusion to the programme. Again the performance is elegant and immediate rather than beautiful, combining an almost geometric sense of the miniature forms with a healthy dose of Expressionist angst. The stylistic continuity from Beethoven to Webern couldn't be clearer, the First Viennese School leading directly on into the Second. This isn't a CD for putting on in the background, fortunately, as many string quartets out there seem to specialise in that sort of thing. Rather, it is a statement of intent, a demonstration of a particular way of doing things with the quartet repertoire. It is a way that really works, and that presumably takes 30 years of experience to perfect. A fascinating listening experience, and a good omen for the quartet's years ahead. Like so many Soviet era composers, there is a temptation to categorise Nikolay Roslavets asmerely a product or even a victim of his circumstances. But he has such a distinctive compositional voice that the experience of listening to this music transcends any considerations of its situation or the political repercussions of its genesis. The distinctiveness of Roslavets' music partly comes down to the fact that he was one of the few composers writing Modernist music (in the Western sense) in the early years of the Soviet Union. It is distinctively Russian though, and there are strong parallels with the music Prokofiev was writing in Paris at the time. There are similarities with Alexander Tcherepnin, not lest the fact that both composers wrote highly accomplished cello sonatas. There is also an important stylistic link in that both Tcherepnin and Roslavets were able to write progressive music that was distinctively Russian but that also moved on from the pervasive influence of Scriabin, whose shadow many of their contemporaries were unable to move beyond. Roslavets is also known for his distinctive post-tonal harmonic theories, ideas that parallel Schoenberg's serialism, but without that Austro-German strictness of application. In fact, the harmonic language here is more palatable than the comparison suggests. In true Russian fashion, Roslavets is always keenly aware of the colour and relative density of his harmonies, and never lets theoretical considerations distract him from the continuity and expressive power of the music's surface level. 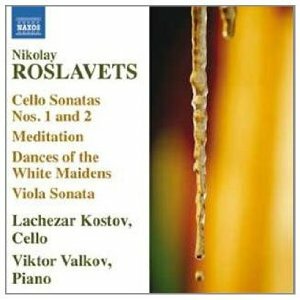 That said, the piano parts in these works, and particularly in the sonatas are often densely textured and it is incumbent upon the cellist to retain the foreground despite the sheer volume coming from the accompaniment.On the whole Lachezar Kostov achieves this very well. He is able to put some real power behind the bow, but always lets the melodic lines sing. His tone is varied, by turns lyrical and incisive, and always pleasant whatever the dynamic. The Cello Sonatas are the main offering here, but the extras are also interesting. 'Meditation' and 'Dances of the White Maidens' are lighter fare, as their titles suggest, and they serve to leaven the density of the main works. Then there is a transcription of a Viola Sonata (apparently numbering is a problem because it is uncertain if he wrote two or three). This too is a more lyrical work, but has moments of dramatic intensity that match the cello sonatas. Actually, it is an impressive transcription; transcribing works between the viola and the cello usually leads to mixed results, and you often end up wishing you were listening to the original version. Not here though, the arrangement and the performance present the work as if it were a cello orginal. Until recently, Roslavets was one of the most scandalously neglected composers of the Soviet era when it came to performances and recordings. Not any more though, and this disc is up against at least two significant competitors, from cellists Boris Pergamenshikov and Alexander Ivashkin. For my money, Ivashkin (CHAN 9881) is the best of the three. He has more variety in his sound and pacing, and more intensity in his fortissimos. As much as anything else he is just more Russian about the whole thing. Kostov has a few intonation problems in the very top register, but then who doesn't? More of an issue is the sound quality. The piano is fine, resonant and presented a spacious audio environment. But the cello has a boxy and constrained sound. It is miced to closely perhaps, but it is a shame that it does not get the same treatment as the piano. A reasonable offering from Naxos, but not a serious contender for the top spot. This disc presents Josquin at his most approachable. It is beautifully sung, everything is very even, and little effort is made to articulate the words at the expense of the flow of the music. It is the sort of recording of renaissance music that you can put on in the background for atmosphere. 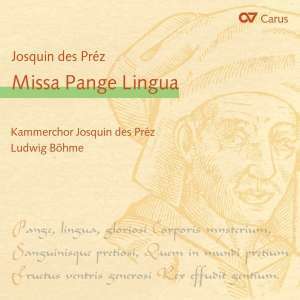 But there is more to Josquin than that, and especially to his Missa Pange Lingua, one of the most revolutionary works of the 16th century. I'd rather it sounded that way, with more contrast in the tempos, timbres and articulation. There is a famous passage in the Credo "Et incarnatus est de Spiritu Sancto...", which in most recordings sounds like it has appeared out of nowhere, an angelic choir interrupting the human voices of the surrounding passages. In this recording it doesn't quite come out like that, the tempo is slowed slightly for the passage, but otherwise it just forms part of the continuous texture. Fortunately, this music is very robust; Josquin writes counterpoint so clear that the individual lines will come through in almost any interpretation. And it has to be said that the singing is to a uniformly high standard. This style of performance with very long, joined up vocal lines must pose considerable physical challenges to the singers, who cope magnificently. The use of a mixed professional choir says more about modern German choral traditions than those of the 16th century. Scholarly opinion favours the view that choral music of the period was sung a fourth or a fifth lower than written. Recordings of Josquin are divided more or less evenly between those who transpose and those who don't. In this recording they don't, partly perhaps because the written tessitura better suits the use of women's voices. The higher pitch adds to the clarity of the counterpoint, but at the expense of atmosphere and solemnity. The acoustic of the Lutherkirche Leipzig is quite dry, at least for a church. I've no complaints about that, this music does not need a wide halo of resonance to achieve its effect. But they could easily have got away with using a larger church and still maintain the clarity. The other works on the disc make for an interestingly diverse programme. The first track O virgo viginum Filiae Jerusalem is classic Josquin, a six part motet of wonderfully intricate yet understated counterpoint. Ave nobelissima creatura Tibi, Domina gloriosa is another case in point. This too is a six part motet, and has an impressively varied texture, moving between the extremes of contrapuntal complexity and homophonic stability, and visiting every point between. The other works include the Gregorian Pange Lingua hymn and some canons with very weak links of attribution to Josquin. They're good, but not as good as the real thing. So on balance, this is competent Josquin, but by no means ideal. In terms of performance practice, there are so many questions unanswered about the choral music of the period that much of it comes down to issues of taste. This recording is aiming to appeal to those who appreciate the professionalism of German chamber choirs and their versatility in performing music of all eras. Usually I'm one of that number, but I like Josquin to sound more gritty, with harder articulation and more tonal focus. Everything here is just too pleasant by half. 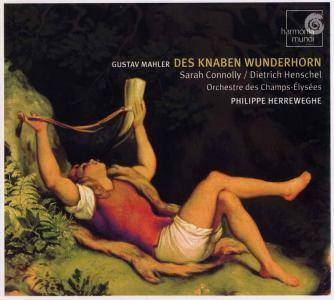 I've been listening a lot recently to Philip Herreweghe's Mahler 4 performed on period instruments. His is a lean account, with little vibrato and no more tempo fluctuations than are strictly necessary. Manfred Honeck's interpretation of the work is at the opposite end of the spectrum, and the contrast between the two recordings is astonishing. Herreweghe demonstrates that the music doesn't need much help from the podium in order to produce drama and profound emotion. Honeck, in contrast, shows that continuous intervention by the conductor can also be musically justified. And the results certainly are powerful and immediate. But it can also feel laboured, as if every detail of the score has to be pedantically spelled out with some heightened articulation or localised rubato. Well, the score doesn't need any of that, although some listeners may appreciate the help Honeck offers in getting to grips with what is, in fairness, a radical work. The first movement gets off to a brisk start. By speeding up the sleigh-bells on the first page, Honeck is able to glide over that awkward tempo transition in the fourth bar. From then on the first movement is a roller-coaster, with every opportunity for dramatic contrast exploited to the full. The orchestra are on top form throughout, with glistening strings, distinctive woodwind solos, and that warm yet penetrating sound from the brass that you only hear from the top American orchestras. The ensemble of the orchestra is also impressive, especially given many radical tempo shifts that Honeck affects. Contrast is again the key feature of the second movement, with some excellent solos from the leader, the horn and the woodwinds interspersing tuttis that regularly risk going over the top. Of course, Honeck knows how to maintain control of the orchestra, so the dangers are always illusory. There is a wonderful sense of serenity at the start of the third movement, which is taken surprisingly slowly. But this too soon gives way to yet more intense drama. By about half way through the third movement, it becomes apparent that Honeck is presenting the Fourth Symphony as if it was of the same scale as Mahler's other symphonic works. It is hard to say whether that is an arrogant or an insightful approach. It certainly forces the listener to address their preconceived ideas about how the Fourth is different. And most importantly, it all adds up to a coherent and genuinely originally interpretation. The volume drops in the fourth movement as the orchestra recedes to an accompanying role to the soprano Sunhae Im. In any other context, I'd say that Sunhae's vocal style is far too florid and operatic for this music, but her performance is exactly accordant with the approach that Honeck has been taking in the previous movements, expressive and direct, if not precisely subtle. The SACD audio quality is up to Exton's usual impressive standards. In fact, the company is fast becoming the market leader in terms of the definition and vibrancy that they can produce from live orchestral recordings. Of course, you need an orchestra that is up to the job to make this sort of recording project worthwhile, and a very significant factor in its success is the fact that every section of the Pittsburgh Symphony plays to an exceptional standard. I've just one grumble, the bass, impressive as it is, doesn't sound very natural. The Exton producers have clearly gone to great lengths to create the soundscape they are looking for, but in other recordings they manage to disguise their post-production balancing behind a veneer of apparently natural sound. The sheer quantity of bass here, and I'm thinking particularly of the bass drum, is spectacular but hardly realistic. 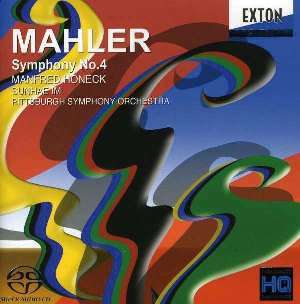 Like the performance itself, the only problem with the recording is a lack of subtlety, and of the all the symphonies in Mahler's catalogue, the Fourth is where you are going to feel that the most. Dejan Lazić makes a big thing of his new approach to Beethoven's Fourth Piano Concerto. A piano quintet version of the work has recently surfaced, apparently by Beethoven himself. It contains more tempo and dynamic markings than the orchestral score, and Lazić has taken to performing the orchestral version with reference to some of these. What this means in practice is that there are some quite abrupt tempo changes in the outer movements, and that some of the quiet transitional passages are taken down a notch or two. They are quite subtle changes though and only warrant attention because they distinguish this recording from the many, many others that are currently on the market at the moment, even on SACD. Lazić's touch and approach to the work in general are more significant distinctions. Unlike many of his colleagues, he is not really interested in the grandiose or heroic aspects of the work, and perhaps this is why the chamber version appeals to him. There is something very immediate about his interpretation that brings a sense of immediacy, even to the loudest passages. 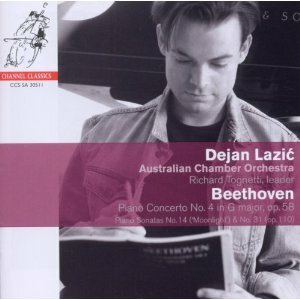 Lazić does more composing, arranging and improvising than most concert pianists, and perhaps these activities contribute to the playfulness and carefree approach that he brings to Beethoven. He plays his own cadenzas for the outer movements, and while they are slightly wayward, stylistically speaking, they too speak of this respectful but always playful approach to the music. The lack of overt drama in his approach risks emotional shallowness, but this is more than outweighed by the freshness that Lazić brings to what would otherwise be overly familiar repertoire. The Australian Chamber Orchestra play to their usual high and consistent standard. Their experiences of performing on period instruments bring a valuable perspective to Beethoven. Vibrato is kept to a minimum, yet there is plenty of life in the string sound. The stylistic disciple of the orchestral playing, combined with the small size of the ensemble, makes the orchestra the idea complement for Lazić. They are nimble enough to follow his unusual tempo changes, and to match the playfulness of his passage work. The Fifth Piano Concerto would seem to be the ideal coupling, but neither the soloist nor the orchestra play in a style that would fit that epic score. It's probably just as well then that they refrained and Channel filled the remainder of the disc with performances of Beethoven Sonatas, the Moonlight and the Op.110. To my ear, the Moonlight is the more successful of the two. Like the Fourth Concerto, it is a work that benefits from a light and playful approach. But the Op.110 lacks weight, some of the individual passages are very beautiful indeed, but in needs a sense of solemnity too, which is largely absent. The SACD sound is, on the whole, very good. In the concerto, the orchestra comes off better than the piano, which sounds curiously distant, while the orchestra, and the strings in particular, have an impressive immediacy and depth of tone. No such concerns though in the sonatas, in which the sound engineers manage to faithfully reproduce both the immediacy and sweetness of tone in Lazić's playing. The concerto and the sonatas were recorded on opposite sides of the world, in Sydney and Eindhoven respectively, but both recordings were made on large Steinway pianos. The fact that Lazić can find such elegant and understated sounds from instruments otherwise known for the weight and projection of their tone is a testament indeed to his phenomenal and unique talent. This is a seriously impressive recording. The Prokofiev Second Concerto isn't the sort of piece you can make sound easy, but Anna Vinnitskaya's control at the keyboard is astonishing, and her playing is near enough faultless. Not many pianists would dare programme the work for their orchestral début recording, but it is clearly the right choice for her. And there is subtly here too, her dynamics range for the barely perceptible to the thundering, and both the gradual dynamics changes and the sudden shifts are handled with expert precision. Precision and control are words that come to mind with the Ravel too. Like the Prokofiev, it is given a clean no-nonsense reading, and like the Prokofiev it is a work that responds very well to it. She approaches the jazz inflections as one might in Gershwin, with warmth but without any sort of stylistic exaggeration. Much of the passagework in the Ravel is presented with a muscular tone and plenty of rhythm. The piece responds just as well to more wispy and introverted approaches, but played like this it forms the perfect coupling for the Prokofiev. And whatever your views on the relative merits of the two composers, the Prokofiev is definitely the main feature of this disc, to the extent that you often feel his presence somewhere in the background of the Ravel. Much of the rhythmic drive in Vinnitskaya's playing comes from the left hand. She never lets the melody lead her, not even in the slow movement of the Ravel, instead keeping a rigorous balance between the two hands. If anything, this makes the virtuosity in the Prokofiev even more impressive, the focussed stability of the left hand acting as the perfect complement to the more dazzling passagework of the right. Naïve are clearly aware of what a huge star they have on their hands, so they've been sure to team her up with a top-class conductor, orchestra and sound team. The Deutsches Symphonie-Orchester Berlin have an excellent recent track record on disc, and this one is no exception. The orchestra has a busy time of it too, especially in the Ravel, and their performance is up to the same high standard as the soloist. The unity of the string sound is as good as you could want, and the crispness of the various woodwind solos in both concertos perfectly matches the precision of Vinnitskaya's touch. The engineering too is superlative. Even the sound engineers are stretched in this repertoire. Both composers write well for the orchestra, but they both throw in experimental textures that could easily disrupt the delicate balance between soloist and ensemble. Surprisingly, both the piano and the orchestra are crystal clear throughout. While the engineers should take much of the credit for this, it is also worth considering what Vinnitskaya's technique offers in this respect. For much of the Prokofiev, it sounds like she is playing full whack, but the fact that so many of the details of the orchestration remain audible suggest that she is achieving this muscular tone at a range of lower dynamics. How does she do it? It's a complete mystery to me, but I can't wait to hear some more. 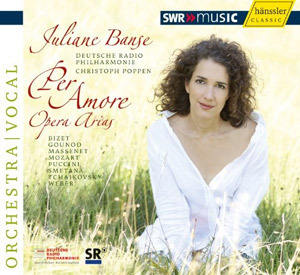 Juliane Banse is best known for her work in the 20th century repertoire, where she clearly excels – just listen to her recent release of Berg and Hartmann on ECM. This disc shifts her focus into the 19th century, and it turns out that she is equally at home in this repertoire. The programming is at the more popular end of the spectrum, but the styles and nationalities of the composers are surprisingly varied, and every work is a tough sing. Suffice it to say that she makes almost every aria sound easy, and her elegant floating voice nourishes every note. So there are no concerns here about bleeding chunks, it all fits together into a beautifully coherent programme. Curiously, the first track, Temerari – Come scoglio from Cosi is the exception. Some of the higher notes here seem strained and the evenness of tone that characterises the later tracks is not as evident. But any concerns that she is struggling with Mozart's idiom are immediately dashed by track 2, E Susanna non vien! from Figaro. This is classic Mozart singing, with an ideal combination of power and tenderness. Those are the two qualities that shine though in the following tracks too. Coming from Southern Germany, she is in an ideal position to embrace the various European cultures represented by Smetana, Puccini, Massenet, Bizet and Gounod. But when it comes to Weber she really excels. And she doesn't necessarily sound like a German singer doing the German repertoire the German way. There is a certain Latin spirit in the way her phrases flow and in the rounded elegance of her vowels. Similarly with the Letter Scene from Onegin, which is delicious, but not in any sense an idiomatically Russian performance. Her vocal support in this track is amazing, and it allows her to continue exploring a wide range of vocal colours, even at loud dynamics and in long phrases. The Italian and French arias give Banse a chance to show off the precision of her vibrato, which is usually quite wide, but always carefully controlled. That makes her Mimi a real treat, creating that ideal paradoxical mix of frailty and strength. Concluding the programme with Massenet, Bizet and Gounod gives French opera a stronger showing than it usually gets in a mixed programme like this. Banse's French pronunciation is perfect, and these big, passionate arias are the ideal vehicle for her always expressive and always emotive voice. The Saarbrucken Orchestra give spirited and colourful backing under the baton of Christoph Poppen. The sound is warm but clear. The liner contains in interview with the star, the words to all the arias, and a good number of glamorous pictures of Banse herself. It is a great compilation and it left me wanting more. Highly recommended. 'Italian baroque meets Argentinian tango' – it's hardly an obvious combination, and given the close proximity of Vivaldi and Piazzolla here (their works alternate on the programme), there is ample scope for stylistic mismatch. In fact, both composers write the sort of music that lends itself to unusual programming ideas, and they are supported by a number of helping hands along the way. The most significant is the Russian composer and arranger Leonid Desyatnikov, who has not only arranged the Piazzolla scores for Vivaldi's forces, but has also added to them a number of explicit references to Vivaldi's concertos. The Desyantnikov arrangements were originally made for Gidon Kremer, whose advocacy of Piazzolla has been both energetic and inspiring in recent years. Despite the detailed programme notes, I have been unable to work out exactly what the original forces were that Pizzolla had in mind for this music. However, it is versatile stuff, and with the violin taking the lead role, presumably from the bandoneon, little is lost in the way of Argentinian colour. 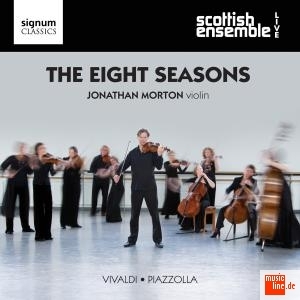 The recording was made live at the Queen's Hall in Edinburgh during a tour, in which the Scottish Ensemble took the Eight Seasons programme to cities around Scotland. The ensemble is made up of a string section of 12, the soloist, and lute and harpsichord continuo for the Vivaldi. The works are therefore presented on quite a small scale, which for the Vivaldi in particular brings valuable intimacy. The multiple performances have allowed the players to hone their ensemble skills, and they play with remarkable precision. That is not unusual in Vivaldi recordings, but by applying those baroque standards to the Piazzolla, the sharpness gives those dance rhythms a real kick. The sound quality is good, although the detail in the string sound could be clearer. More importantly though, the relationship between the violin soloist and the ensemble is just right. He is always distinct but never separate. That is a tricky balance to get right, and to do so in a live recording is all the more impressive. In terms of the repertoire, the Scottish Ensemble are up against a single but formidable competitor: Gidon Kremer himself with his famous elite ensemble Kremerata Baltica (Nonesuch B0000206A4). Generally speaking, Kremer is more energetic with both composers, which serves the Piazzolla better than the Vivaldi. The Scottish Ensemble are more laid back, and in the Vivaldi they bring a real sense of poise, an ideal blend of historical sensibility and regulated energy. Keremer's energetic approach gives him the edge in the tangos though. There is no place for genteel reserve here, and Kremer's more sultry approach, only barely suppressing the deep passion beneath the music, is much more in the spirit of the nuevo tango. On the other hand, Kremer struggles to define the musical connections between the Vivaldi and the Piazzolla, and that is something the Scottish Ensemble seem to manage much better. They don't make the Vivaldi any more tango, but they refine the tango to the sensibility of the baroque. When Kremer conceived this programme, he was obviously hoping to surprise his audience with the coherency of the results. In the event, he is too carried away with the Piazzolla to let issues of programming logic hold him back on the stage. By taking a more measured approach, the Scottish Ensemble succeed in bringing this paradoxical idea to fruition. It's been fifteen years since Wolfgang Wagner's last production for Bayreuth – Meistersinger in 1996. Nevertheless, Tankred Dorst's Ring is the last staging of the cycle that Wolfgang commissioned, and so marks the passing of an era. In retrospect it is probably going to look like a very radical change indeed. The jump from Wolfgang's Meistersinger to Katherina's was a genuine paradigm shift for the house, and the conceptual distance between Dorst's Ring and the new production from Wim Wenders, currently in preparation, seems destined to be just as extreme. Faced with the most daunting challenging in all opera, Tankred Dorst opts to keep things simple. There is no radical reinterpretation here, no Freud, no Nazis, but he also largely avoids falling back on tradition too. Dorst's background is in theatre (spoken theatre), a fact that comes through in many aspects of his conception for Die Walküre. The setting for Act 1 is a derelict 18th century mansion, a scene you could equally imagine in Chekhov or Ibsen. The sets for each act are more or less static, and Dorst clearly expects the singers to really act. But the kind of acting he is looking for doesn't quite work on the opera stage. What could work as coherent characterisations in spoken theatre become assemblages of isolated an exaggerated gestures, simply through the scale and pace of Wagner's drama. However, there are many scenes in this opera where the approach has its benefits. Each act has extended two-hander scenes: Siegmund and Sieglinde in Act 1, Wotan and Fricke and Act 2, Wotan and Brünnhilde in Act 3. Intimacy and empathy are required in each of these, and more spectacular productions run the risk of overpowering the emotion. And if the singers' gestures seem exaggerated, it is worth bearing in mind that the camera is much closer than the audience, so we are not really given the correct perspective, valuable as these detailed images are. The one interpretive decision that does offer some genuine insights is the decision to visually separate the gods from the mortals. In the first and third acts, there is a high balcony, from which Wotan can look down on the action. That is traditional enough, to the point where it would be a radical departure for a production not to use this device. But the costumes also make the point; Siegmund, Sieglinde and Hunding are all dressed in plain, pastel shades, while the Valkyries and the gods have more elaborate dress. And there is no missing the Valkyries, who are dressed in crimson with transparent perspex helmets and shields, Wagner meets Kraftwerk if you will. Conductor Christian Thielemann is a fascinating Wagnerian. He is an interventionist conductor who never lets the music just play itself; everything must be sculpted and shaped. That's not to say his approach is megalomaniac (although he's got that Karajan stare in all the photos); there is a real sensitivity to his approach, but he always makes his presence felt. In fact, his conducting perfectly complements Dorst's theatrical approach to the work. Just as Dorst places the emphasis on the individual utterances of the characters, so Theilemann moulds the music around their phrases. The orchestra rises and falls in line with the singers' phrases, rubato and dynamic gradations are brought into play to emphasise the meanings of lines, and the balance always favours the stage over the pit. That means the singers don't have to work quite as hard as they might for, say, Solti or Karajan. This gives them scope to sing with real individuality, which will no doubt benefit the audio-only release which is currently available on CD. 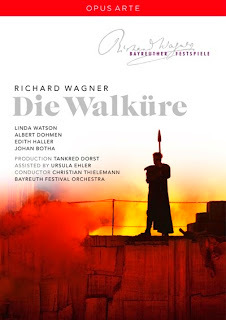 It means that Johan Botha can play out the naïve and heroic dimensions of Siegmund, Edith Haller the vulnerability of Seiglinde, and Albert Dohmen the conflicted emotions of Wotan. Vocally, the only two questionable casting choices are Dohmen as Wotan and Mihoko Fujimura as Fricka. Both seem more comfortable in the lower register of their part than at the top, although in both cases that can work to the advantage of the drama. Wotan's indecision can be heard in the timbral contrast between his lower and upper notes, while Fricka's cold-heated insistent demands have all the more power for the colourless, emotional neutrality of Fujimura's upper register. The Valkyries are an astonishing ensemble, and the singing at the opening of Act 3 is the best I've heard recorded. As befits the high proscenium arch of the Festspielhaus, the sets are all quite vertical. That poses a problem for the camerawork, not least that the frame is essentially square – not ideal in the widescreen age. Most of the camerawork is done in closeup, which as I mentioned can make the acting gestures seem exaggerated. However, the editing is good, cutting between the various singers to keep the viewer closely connected to the action. There is a making-of documentary on the second disc, which is quite interesting although frustratingly brief. When the video team are interviewed, they imply that the editing was done live, which seems like an unnecessary pressure. The fact that the filming is of a single performance (21 August 2010) is interesting. I'm not sure there are any specific benefits to the viewer, but it is notable that the sheer musical perfection of what we hear is the result of a single unedited performance. The sound quality is excellent, but highlights a peculiarity of the Festspeilhaus acoustic. Wagner went to great lengths to ensure the correct balance in the hall, and the raked orchestra pit is intended to emphasise the string sound over the woodwind and (especially) the brass. But the balance and volume of a symphony orchestra, which is what this is, has changed beyond all recognition in the intervening years, making these measures all but unnecessary. However, the result is a soundscape that is distinctly hierarchical, with the singers above the strings above the wind. And the hall has a surprisingly resonant acoustic too, there is a warmth to the recorded sound of the voices that can only come from the venue. None of these is a problem, but it is interesting that in these technologically advanced times, we are now in a position to hear every detail of the acoustical interventions that Wagner made for the performance of his own music. For the amount of Wagner out on DVD these days, it is reassuring that even at this level of technological detail, there is something about the Bayreuth Festival that will always make its productions distinctive. This disc is a typical triangulation of continuing ECM themes: a talented, young central European performer, a respected composer long associated with the label, and of course a cover illustration unlike anything you've ever seen before. The inclusion of Schumann may seem like a new departure, but this is not the only recent ECM disc to combine standard repertoire works with more modern fare. The justification in this case is the influence of Schumann's piano music on the Holliger work. But despite the views of the composer himself and the author of the liner notes, the connections are far from obvious. Schumann's long, flowing melodies stand in marked contrast to the more stochastic textures of Holliger's Partita. There are connections, but they are at a much deeper level. Both composers have a curiously paradoxical relationship with the piano. It is as if neither really wants to write for the instrument and is always trying to make it sound like something else. And yet both are consummate craftsmen, who ensure that every bar they write is deeply idiomatic, so as to make the most of every musical possibility the instrument has to offer. Then there are the "Sphynxen für Sch. ", explicit references to Schumann's work in Holliger's score. Schumann stated that his Sphinxes should not be played, and Holliger distances his, at least from performance at the keyboard, by having the performer reach into case to play the strings directly. The first of the two is the more effective, and here we find pianist Alexander Lonquich stroking the bass strings at the absolute minim dynamic. It is at points like this that you realise just what benefits the high quality of ECM's sound recording can bring to a project like this. I can well imagine this effect being all but obscured by lesser technology. These Sphinxes suggest deep thematic connections connecting the movements, and certainly the overall impression is of episodes, contrasting in mood yet somehow unified at a deeper level. And this is perhaps the most significant connection to Schumann; Holliger goes to emotional extremes, a fact he makes explicit by contrasting one movement against the next. But if he is trying to convince us that his own psychological makeup is as complex and as fragile as Schumann's, the elegant sanity of the work's construction gives the game away. Lonquich plays the original rather than the more famous revised version of Kreisleriana, although he admits that the differences are slight. His performance is lyrical and Romantic but always disciplined. The phrases are sculpted with a seemingly free rubato, but the tempo changes are always within fairly narrow limits and the metric logic of the music is never threatened. And he is not above lingering on the more beautiful moments, or driving the music on in the build up to a climax. In short, it is an ideal ECM reading of the work, and is perfectly matched by the clear yet resonant sound engineering. Both the Schumann and the Holliger are given excellent readings here, and while the connections between the two remain nebulous, there is no doubt that listening to the Schumann is the ideal preparation for the Holliger. And if, as I suspect, Holliger's Partita appears here primarily as a justification for getting the Schumann into the ECM catalogue, then why not? Both works are well worth hearing, but it's the Schumann I'll be returning to soonest.